Studio Four IV is a creative design studio with a difference. It doesn’t just design the look of the store, but also has expertise in branding, graphics, and even furniture. As a result, Studio Four IV considers all of these elements on a project to create something cohesive – from the way the shop looks down to the signage. Can you tell us about Studio Four IV and your role? We are an interior design and graphic agency. As co-founder and owner, I manage the 3D side of the business, including interior design, architecture, furniture and product development. My co-founder Andy Bone runs graphics, film and brand strategy. We do a lot of retail, hotel and residential work for private clients. Most of our work is actually outside the UK, in America, the Middle East and the Far East. We’ve found that we tend to link up with a brand and then follow them. 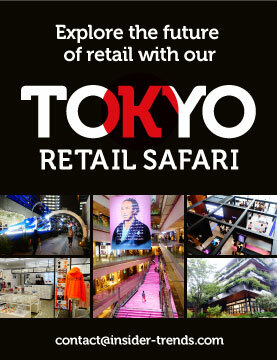 For some brands we’ve designed in excess of 80 shops for them around the world. We work right across the breadth of retail from high-end design boutiques and department stores, to the middle and lower-ends of the market. I believe that concepts that are utilised at the high end can be borrowed for the middle and the middle can be borrowed at the lower end. Do projects often span both sides of the business? Absolutely. That’s the type of project that we love to work on. When Mulberry gained an investor, we were involved right from day dot to create a new brand positioning for the business. 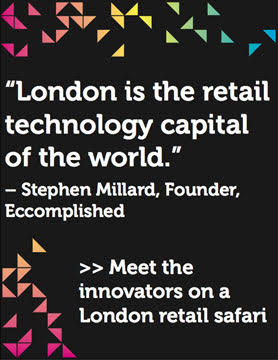 That was then followed by a tangible luxury store and then a store roll-out. It also covered all of the advertising, the collateral and new brand guidelines. It is actually a really wonderful mix of the two disciplines because everything is considered at one stage. So often now you see a really beautiful shop, but nobody thought about displaying the product or how it’s illuminated or signed. There’s absolutely no doubt that the role of the store has changed. In the luxury arena you’re seeing much more differentiation between brands. They want to own their own look whether that’s focused on a particular colour or material choice or method of display. It’s about individualism at the top. There’s been a simplicity applied to the design with more of an interest in luxury materials. If you look at Balenciaga or Celine, they’re actually incredibly simple stores but use very high-end luxurious materials. A lot of the stores now reflect the whole brand ethos, so the simplicity of a Celine skirt is then reflected in the way the product is displayed and how the store is laid out. There’s a real lift in experiential stores, which has really been spearheaded by a lot of the sports retailers. The experience of a store is absolutely paramount. People are fighting for individuality and to really own the experience across every single touchpoint from customer service to how you pay. People are being invited into stores for things other than buying, such as exhibitions and talks. When you’re dealing with high volume, for example, there are very set techniques that are researched to the nth degree. To the general public something might seem like a very tiny change, but actually the impact of that can be felt widely through a large business. Self-checkout in the supermarkets is a great example. It started off at a very introductory low level but has been hugely successful and is now used across other sectors and can be found in Zara and Nike’s stores. Now you can’t walk into a store without seeing that sort of self-payment point. Often in airports and train stations that’s the only way you can pay now and Amazon Go has taken this one step further. The whole definition of a store is changing but stores will always be valid. People want to get out. It’s not just about receiving a pair of shoes in a box in the post. That’s one way, which might suit people who are cash rich and time poor. But I also think that people want an experience. 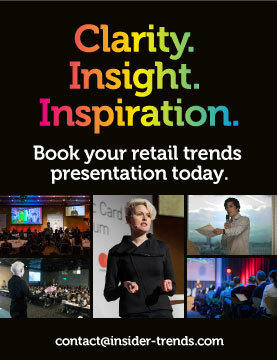 We see that in the way that big shopping centres are now being designed for a whole day. It’s about entertainment as much as it is about actual physical purchasing. How has the client brief changed in the last five years? Some people are very open in their brief and want to create a concept that is personalised to their brand. Some brands will focus on one thing more than the other. For example, the project we did with Clarks shoes really focused on the heritage and the manufacturing process. In the store the key visual item was some wooden shoe lasts because it’s about the level of detail that goes into the production of the item. In the past, even at the luxury end of the market, clients would come up with a store concept and then it would be rolled out worldwide. 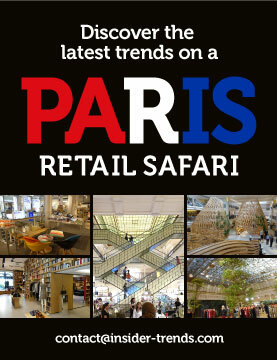 Now the store concept has to be tailored to local markets and demographics. In the Middle East there have been big changes in local custom and religious values but you still have to take that into account. We did a Mamas & Papas store in Mecca and there were some very specific guidelines that we had to follow on the store design and access. It is really important for a brand to be aware of that, even for very simplistic things like merchandising. It’s not just a case of plugging in a shop-fit hoping for the best. Anyone who’s really really successful not only tailors the product but also tailors the actual store and the customer service to the local market. Has the lifespan of a store design changed? In some cases it has. Some brands have put a lot more finance behind some of their store fits, therefore they’re really judging very carefully where they open stores and they’ll do an awful lot of research prior to any investment being made. On the other side, a lot of pop-up stores are happening at the moment. They have a massive validity these days. It not only allows a store to open and trade, but it also allows that local area and demographic to be assessed and could very easily be followed by a full store in the future or dismissed as a location for that brand. If it’s a lower investment, then very often there’ll be more tweaks to it and more individualised to local markets. Are clients looking for more flexible store designs? It depends on the market that you’re working in. One of the areas we’ve seen a lot of development in is branded concessions. We recently completed the international womenswear floor for Harvey Nichols in Knightsbridge, which features lots of premium brands like Valentino, Balenciaga, Jimmy Choo and Christian Louboutin. What is very expensive for the brand is the shop-fit. What is difficult for the retailer is that they want to be able to move the brands around to refresh the floor regularly and keep it lively and interesting for the repeat customer. With that in mind, we almost completely abandoned the idea of branded shop-fits. We’ve created pockets within the floor for them, but it’s our flooring, our ceiling and we’ve created merchandising units that are bespoke to Harvey Nichols. The brand is then invited to soft personalise. They can bring in their own midfloor merchandising unit and furniture, and they can also anchor their area with a floor finish. It’s all designed so that it can be moved around quite quickly. It offers up a completely different look and feel for that particular brand at a time when you could jump on a plane and be in Hong Kong or Milan or Kuala Lumpur and go into a department store and see exactly the same shop fit for a brand. How is technology factoring into client conversations? One thing that is interesting about any conversations with clients about technology is they always focus on screens and touchscreens and magic mirrors. But they don’t think about creating content for those screens. For some companies it creates a revenue stream because you can get brands to rent the screens, but for other companies they just want to personalise it to their store. The effort of creating the content for those and constantly revisiting it as part of the retail calendar is a big piece of work and not something that should be committed to lightly. There’s nothing worse than people going into the store and the screens still being the same. It is a significant investment. We did a store for Harvey Nichols in Doha, which has numerous large-scale screens with different advertising campaigns running through for everything from fragrance to beauty to ready-to-wear to accessories and jewellery. With one of the fragrance tables, the tabletop is actually a screen with flowers on it. When you pick up the fragrance bottle all the flower petals blow across the table. It’s just a really nice memory of those particular fragrances. That sort of thing doesn’t necessarily need changing so much. Are you seeing a lot of crossover between retail and hospitality? One of my favourite hotels is The Upper House in Hong Kong. Everything that you want to operate in the room like curtains and lighting is done from an iPad. Even the room service menu is on the iPad rather than being printed. There’s a massive crossover there. Vending is also becoming quite important within that sector. We worked on a project called Aerotel, which is based around the idea that you can book a room on an hourly basis when in transit. They have a swimming pool. They have a spa and hairdresser and there’s lots of vending. You can buy things like food, suntan lotion, toothbrushes, shower cups and swimming trunks. We’ve done one at Heathrow and one in Singapore, so if you have a five-hour stopover then, for quite a reasonable price, you can have a few hours’ sleep, you can have a swim, something to eat and a massage. That’s almost borrowing from developments in the airline lounge. Do you see any big shifts in terms of retailer formats or portfolios? At the luxury end Prada is a very good example. They had a lot of concessions but all that has really changed. They’re really focusing on their own stores as a way to keep their offer premium and high-end. Groups like that are being really careful on how you can buy and when you can buy and the way they release products in order to protect their USP. At the other end of the scale, with Argos most people don’t use the shop to shop, they will use the catalogue at home or the website. The shop is a destination pick-up point and that whole concept has gone into the store design. It’s very convenience driven. Another great example is Apple. They’re really focused on their stores. They do sell through other places, but their presence within those stores is minimal. When you go into an Apple store, the product is out on the shop floor and you’re invited to fall in love with it. It’s all about providing the information to convey to the customer the USP of a particular product. What are your plans for Studio Four IV in the future? We’re developing new areas of the business. Clients aren’t necessarily wanting us to roll out brands as much as in the past, but we’re invited in as a consultant to share our knowledge about working in different countries. I think we’ll be doing that more and more and helping create this individualism. Strategically there’s a huge amount of research that goes into providing brand positioning that reflects the brand in everything they do, and that’s an area where we have a wealth of experience. Here’s 50 of the best luxury stores in the world for you to wrap your eyes around. 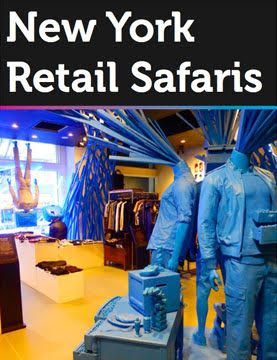 Find out more about the latest trends in retail by taking part in one of our Insider Trends retail safaris.